The preview of next version of Windows Live Essentials (previously known as Windows Live Installer), Windows Live Essential wave 4 which contains Windows Live Messenger 2011 (or 2010), has been released by Microsoft. Windows Live Essentials is a collection of a suite of freeware applications by Microsoft which offers integrated and bundled e-mail, instant messaging, photo-sharing, blog publishing, security services and other Windows Live entities. Windows Live Essentials is also providing applications for Windows 7 that been unbundled from Windows 7 due to antitrust concern. Windows Live Photo Gallery and Movie Maker: make it easy to create visually stunning photos and videos that can share with friends and family. Windows Live Photo Gallery and Movie Maker: ribbon toolbar that puts all the right tools at user’s fingertips for easy access and efficiency. Windows Live Photo Gallery: new Find tab to naturally filter your photos by faces, names, date, geo-location, descriptive tags, folder titles or any combination. Windows Live Photo Gallery: Facial Recognition technology allows Photo Gallery to find pictures that have people in them and deduce who is in those pictures based on whom user has tagged in the past. Tags made in Photo Gallery travel with the photo wherever it goes, and any tags you or your friends make on sites such as Facebook also sync back down to your Photo Gallery. Windows Live Photo Gallery and Movie Maker: Ability to photo fuse (take the best parts of multiple photos to combine them into one “perfect” photo), retouch, batch auto adjust or fine-tuning on exposure, color balance and sharpness, AutoMovie themes (add transitions, a title, captions and a music soundtrack to video or in Photo Gallery’s slide show mode), video and audio editing, save in high-definition 720p and 1080p, easily share and publish to Facebook, Flickr, YouTube or SkyDrive with the extensibility to add plug-ins for other online sharing sites, or mobile sharing to a portable device such as a Windows Phone or Zune HD player. Windows Live Mail: Easy and familiar with Outlook Express, Windows Mail or Outlook. Windows Live Mail: Email account aggregation to manage multiple email accounts, calendars, RSS feeds, contacts and newsgroups in one place. 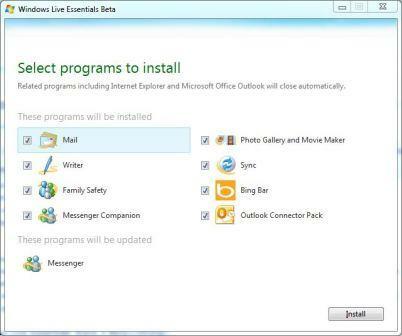 Windows Live Mail: Offline access where email sent or calendar edits made while offline will be queued up and synced next time PC has an internet connection. Windows Live Mail: Access, view and edit calendars that have been shared. Windows Live Mail: Windows Live Messenger integration where user can reply to friends with an instant message right from Windows Live Mail, and presence information is integrated right into the email header. Windows Live Mail: Efficient inbox management tools such as conversation threading and quick views. Windows Live Mail: Slim Cal allows instant view of calendar without navigating away from the context of inbox. Windows Live Mail: User can send photos in email without worrying about size restrictions, and can add captions and layouts or edit photos from within Windows Live Mail. Windows Live Sync: Based on Live Mesh to sync folders across all your PCs (and Macs). Windows Live Sync: Remote Desktop support where users can leave PC online and users can access it from devices.live.com to remotely control the PC. Windows Live Messenger: Tabbed conversations, integration of Bing results, high-definition video chat, video message, badges and games. Windows Live Messenger: Availability of web messenger at messenger.live.com, integration with Hotmail and Windows Live Messenger for the iPhone, Windows Mobile Phone, and Blackberry. Windows Live Messenger: Messenger Companion to detect and view what friends share and comment. Windows Live Messenger: Connect other networks such as Facebook and MySpace to integrate friends, communications and updates, with support for single contact list, inline commenting, richer status update and synchronized status updates. Windows Live Messenger: Simple and advanced control on privacy settings. Windows Live Messenger and Windows Live Photo Gallery: Kinetic scrolling. Bing Bar: Replacing Windows Live Toolbar. Windows Live Writer: Anytime access and by simply signing in to Windows Live ID, user can access published blogs and drafts from any PC in the world. Windows Live Essentials Wave 4 beta has the build version of 15.3.2804.607, and can be downloaded from live.com, or by using the following direct download links. Note that there are two setup installers for Winodws Live Essential Beta wave 4 beta, namely wlsetup-webd.exe which install every apps directly and right away without any question asked, and wlsetup-webc.exe which allows user to select and customize application programs that he or she wants to install or upgrade. 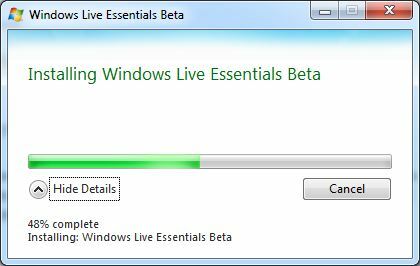 Windows Live Essentials Wave 4 beta requires Windows Vista or Windows 7. Windows XP is no longer supported.